Fremantle captain Nat Fyfe takes Channel Seven on a tour of Freo's new facility at Cockburn. 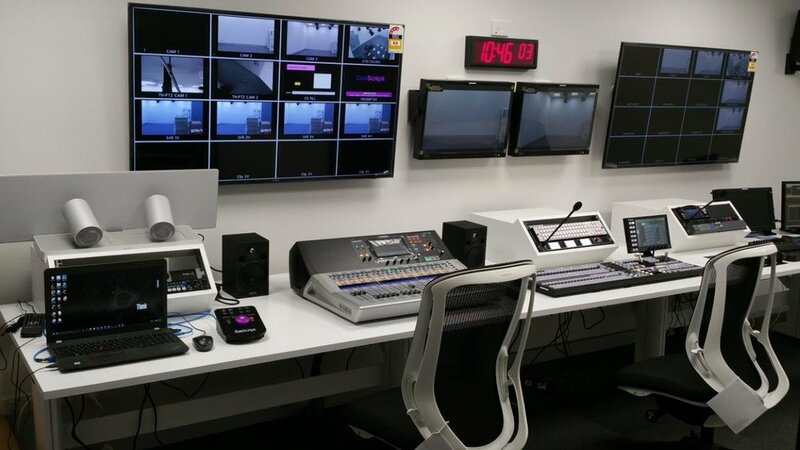 Sydney, Australia, 27th September 2017 – Techtel was selected by the Fremantle Dockers Football Club (FDFC) to build a state-of-the-art multimedia centre to be used by both the AFL club and wider sporting community for interviews, media conferences, post-game analysis and to produce more innovative training tools. The AFL is leading other sports for their use of technology and it is becoming increasingly common for clubs to utilise these means to gain a competitive advantage and allow for greater exposure of their sponsors. FDFC’s Perth facility is part of the new Cockburn Aquatic and Recreation Centre (Cockburn ARC), a fully integrated sporting complex that caters for a full range of aquatic, indoor and outdoor sports for the Cockburn community and surrounding areas of Perth. Through a tender process, Techtel was selected to build FDFC’s new TV studio, control room, multiple edit suites, interview rooms and a theatrette. Drawing on both their technical and production consultancy capabilities, Techtel was responsible for the detailed design, system build and configuration, and then ultimately the final installation. The FDFC studio features a Panasonic AJ-PX380G HD camera with Fujinon lens, CueScript EMCP15M prompting system and lighting from Lumos, while in the control room there is a Panasonic AV-HS6000 2ME vision switcher and a turnkey VidiGo graphics system from ChyronHego. Storage is provided by the Verde Enterprise NAS from Spectra Logic, monitoring by TVLogic and video terminal gear by LYNX Technik, as well as a number of converters from Apantac. Those attending sessions in the new theatrette will enjoy 7.1 channel surround sound and a 140” deluxe screen wall. The Medialon Showmaster LE Embedded Show Controller will automate and synchronise dimmers, lighting desks, video projectors, video servers and sound processors within the lecture theatre to allow for a seamless transition between the various presentation tools available. Players will also benefit from post-game analysis and strategy sessions in the theatrette with ChyronHego’s Coach Paint, an easy-to-use visualisation tool helping coaches improve their players’ technique. "Working with Techtel has been a great experience”, commented Adrian Lacquiere, Strategic Projects & Facilities Manager at the Fremantle Football Club. “They had to work within our building programme over a 9 month period to deliver the final solution and the feedback of the end result from the coaching and playing group has been positive. The club saw the need to significantly invest in multimedia due to the exponential growth of the industry as well as the increasing amount of content being delivered by the club. As a result, we now have state-of-the-art facilities that have set the benchmark for the next generation of elite sporting facilities. We continue to develop new ways to use the system all the time and we're working closely with Techtel to draw from their experience in the media business”. ”Fremantle’s new facility has really put them up there as a team that embraces technology to improve their fans’ engagement and involvement with the club, said Techtel’s CEO, Mal Chandler. “The added benefit of all this technology also affords the players easier access to coaching aids and analysis. Techtel was thrilled to have the chance to work with the club and we’ll be cheering them on in the years to come”. The install is now complete following technical handover of the system and training of staff. Techtel will provide ongoing support for the facility.